You save $23.88 on quantity of 6 bulbs over �each� price on this variety. Spicy fragrance, 3 to 4 Feet. Late July / Early August flowering. 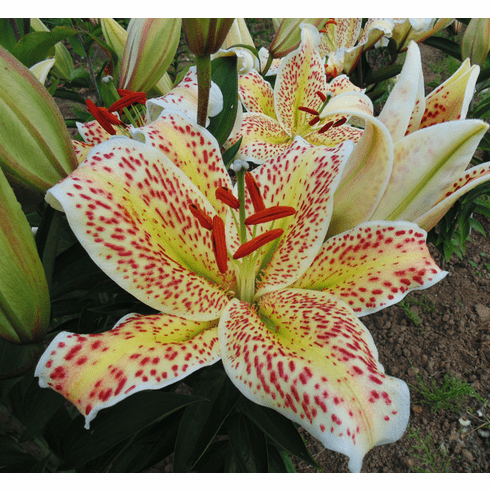 A nice change from solid color lilies, this heavily spotted "Gold Band" is reminiscent of the old 'Imperial Gold' lilies from years ago. More than just a Gold Band lily, the green nectary furrows of 'Cat's Eye' tend to extend their color into the yellow during cooler weather. Mostly upfacing, the scent is wonderful and all those spots add a real WOW factor. The main photo was taken in the field of flowers opening in full sun. The photo insert was taken in a shade house with lower light conditions. 3 to 4 Feet. July / August Flowering. Magnificent Fragrance.